You can see what's on the menu this week below or download the Full Menu, Weekly Picture Menu or the Vegetarian Weekly Picture Menu. You can also view our annual menu promotion planner. We are extremely lucky to have our meals cooked on site. We have a choice of main courses plus a vegetarian option each day and children can choose puddings from a wide variety, which always includes fruit. Water is served to all children at lunchtime but if your child would like juice or a carton of milk, then please bring an extra 20p for juice, or milk in a named purse. If your child is absent the money will be carried over to the next week, or can be refunded at the end of the school year. If a child goes home on the day after 10.30am, for whatever reason including sickness, the money is forfeited. Menus are sent home with the children and the day’s choice is displayed on the white board in the hall. 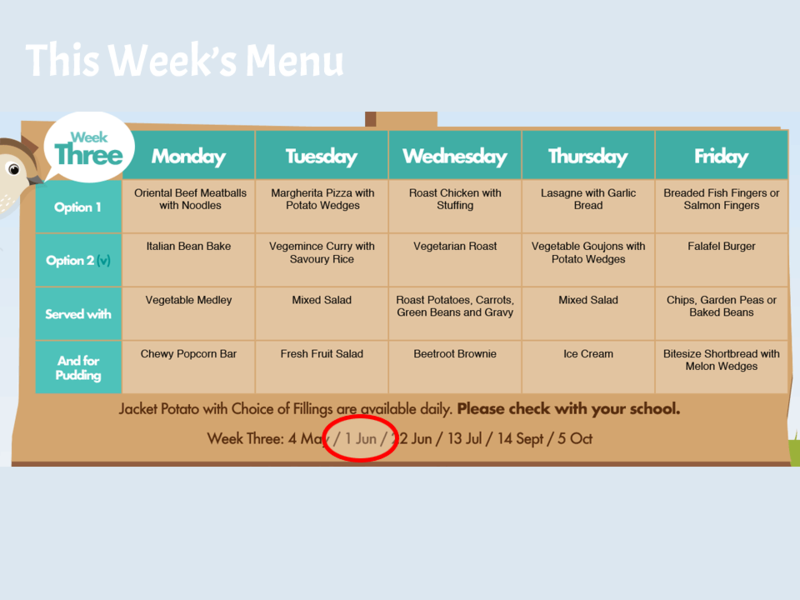 If you receive Income Support, Income-based Job Seekers Allowance or Child Tax Credit please collect a form from the Headteacher or the School office to apply for free meals. The school also provides a place to sit for children who wish to bring a packed lunch. If you include a drink, please ensure that it is not in a glass bottle or a fizzy drink. Children who have a packed lunch can purchase a drink at lunchtime. They will need to bring 20p in a named purse or envelope. If you take your child home for lunch you will need to sign him/her out at the school office. It will also be necessary for you to sign him/her back into school so that we have a record that your child has returned. Any child who goes home to lunch should be returned to the school office at 1.15pm. The school participates in the free fruit for schools scheme. This enables all the children to try a variety of fruit at break time free of charge. We encourage children to drink small amounts of water throughout the day as this practice has been proved to lead to improve learning and health. If you would like your child to bring water into school please provide water in a NAMED bottle with a SPORTS TYPE TOP (These can be purchased at the school office).